Curiously, the earliest American submarine, the U.S.S. Holland (SS-1), had a much more efficient underwater design than those that followed. It turned out that hull designs which worked best while submerged tended to make for very wet, unstable operations on the surface. As it wasn’t possible to stay submerged for extended periods, the practice quickly became to design for surfaced efficiency, as that was where the boat would be expected to spend the majority of its time. This even applies to other liquids. Gasoline and oil weigh less than water (are less dense), so they float on top of it. This will be important later. A submarine works by being able to vary its displacement. Most of the time the ballast tanks are kept full of air, which makes the sub light (less dense) than the water it displaces. You can demonstrate this principle by inverting an empty glass and trying to push it under in a sink full of water. As long as it stays full of air it will want to float. 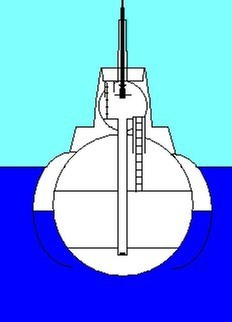 In this graphic, the boat is surfaced, with the air trapped in the main ballast tanks keeping the boat on the surface. To submerge, the crew opens vents at the top of the ballast tanks. This lets the air out. The bottom of the ballast tank is open to the sea, so as soon as the air is released water floods in to take its place, the displacement increases, and the boat slips beneath the surface. Submarines are designed so that, with the main ballast tanks fulls, the weight of water displaced will be as close as possible to the weight of the boat. That is, there should be a balance between displacement and buoyancy, referred to as neutral buoyancy. If true neutral buoyancy is achieved the boat will float at whatever depth it presently is, unless something acts on it to make it rise or sink. In practice, submariners prefer to maintain a very slight positive buoyancy, so that if power is lost the boat may be expected to slowly rise to the surface. In addition to the main ballast tanks, which are normally kept either empty or completely filled with water, there are also several variable ballast tanks located inside and outside the pressure hull. These include bow and stern buoyancy tanks, various trim tanks, and the negative and safety tanks. In a quick dive, the negative tank is important. By flooding this tank the boat is made negatively buoyant, which gets the boat under water quicker. Once submerged, though, the negative tank is blown “to the mark.” You want the boat to be heavier than the water it displaced while diving, because you want to get under as quickly as possible. Once you’re under you want neutral buoyancy. If the negative tank remained full and power was lost the boat would continue to sink until it reached crush depth. “To the mark” means blowing out as much water as possible, but stopping at a fixed point before the tank is completely empty and air starts escaping into the sea and gives away your position. The safety tank on a fleet submarine, which is normally kept fully flooded while submerged, holds the same volume of water as the conning tower. If the conning tower floods and has to be abandoned, the safety tank can be blown dry to compensate. Buoyancy and trim tanks are used to adjust the center of balance of the submerged submarine. By pumping air and water back and forth between the trim tanks the diving officer can balance the boat. In this graphic, the boat has submerged. The main ballast tanks are full. The purple shading represents free flooding areas in the superstructure. Water can flow freely in and out of these area, but has no effect on displacement. The superstructure is made free flooding to eliminate air pockets that might affect trim, or potentially release a cloud of bubbles that might give away the boat’s position. There are also fuel ballast tanks. In American fleet submarines, additional diesel fuel was stored in these tanks, floating on the seawater admitted at the bottom of the tank to insure they remain full as the fuel is used. As the fuel is withdrawn, it is run through filters to remove any water that might have become mixed with it. 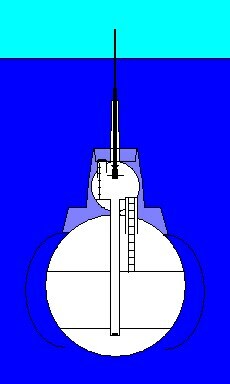 The ballast, fuel, and trim tank arrangement shown in this graphic is typical of an American fleet submarine. The light blue tanks are main and variable ballast tanks. The central ballast tanks are divided along the central axis of the boat, and are located outside the pressure hull. When submerged, these are always completely filled with water. Were any air left in these lightly constructed tanks, pressure at depth would probably distort or even crush them. Having them completely full of water, and open at the bottom, equalizes the pressure. One of the engineer officer’s jobs is to keep the trim adjusted as the fuel is used up. Fuel oil is lighter (less dense) than sea water, so the boat becomes heavier as the fuel is used up and replaced in the fuel ballast tanks by seawater. The fuel ballast tanks, as well as the clean fuel tanks, are indicated in red. The small purple tank abaft the forward fuel tanks is the negative tanks.This is located inside the hull, and positioned forward of the center of balance, so that flooding it will induce a downward trim. The green tank is the safety tank. As this is intended to compensate for a flooded conning tower, it is located in the same relative position to minimize the effect on trim. The small brown tank inset into the top of the forward main ballast tank is a sanitary tank. This one receives waste from the officers’ head. Another sanitary tank is located aft, and serves the enlisted head. The dark blue tanks at bow and stern are trim tanks. These are located at the extreme ends of the pressure hull, so that the transfer of the smallest amount of water possible will exert the largest relative force. The light blue tank in the bow is the bow buoyancy tank. This is blown during surfacing to impart an upward angle on the boat. The bow and stern planes, which project out to the sides of the boat, are used to “fly” the boat through the water when submerged. By varying the angle on these planes, the boat may be made to rise, sink, or remain at a steady depth as it moves through the water. Since the boat is normally trimmed to a slight positive buoyancy, the planes are used to hold it down. This is a safety factor. If all power is lost, it’s normally preferable to rise slowly to the surface, rather than sink. Even in wartime there’s always at least a chance of survival. If you sink all the way to the bottom in mid ocean there is a 100% chance of dying. In practice, the bow planes are used to move the boat up and down in the water. The stern planes are used to keep the boat at the desired angle. In a fleet type submarine, the flat upper deck also serves as a planing surface while diving, providing an additional downward push. In American boats, the planes were operated by men turning large control wheels, which were geared to shafts running along the inside of the pressure hull to the planes gearboxes. Most of the time, hydraulic servos provided most of the power, but the planes could also be operated manually when necessary. In German submarines, the planes operators used small levers to control the electric servo motors that operated the planes. Naturally, there was also a mechanical connection that could be used in an emergency. Any submarine follows a carefully thought out and rehearsed sequence to get under water. These procedures are followed even in the direst emergency situation, because skipping a step can, and has, resulted in sinking the boat and killing everyone aboard. The procedures given here are for an American Gato class submarine, similar to the U.S.S. Bacalao. Clear the bridge: The captain gives the order to clear the bridge just before diving. At this point everyone topsides goes below. The captain (or officer of the deck, if the captain isn’t on the bridge) is always the last man down, and closes the hatch behind him. The captain keeps tension on the lanyard to seat the hatch, and the quartermaster of the watch climbs up and spins the locking wheel. Stop engines: In the control room the diving officer, or the petty officer of the watch, if the diving officer hasn’t reached the control room yet, gives the order to stop engines and switch to battery power. The diesels are shut down, and in the maneuvering room the electricians take the motors off generator power and switch them to battery power. At the same time, speed is set to all ahead two thirds. Close main induction: The main induction is a large air intake pipe, located at the rear of the conning tower, that supplies air to the engine rooms. It has be closed and sealed before diving or the engine rooms will flood. This is what happened to the U.S.S. Squalus, which was sunk on a training diving in 1939 with the loss of half her crew. One theory, never confirmed, was that the vent operator, in trying to flood the negative tank, accidentally opened the main induction instead. 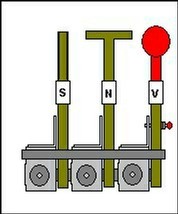 Following that accident, the safety (S), negative (N), and main induction (V) levers were redesigned so that they could be instantly differentiated by touch alone. In addition, a spring loaded locking pin was added to the main induction lever, locking it in the closed position, so that two hands were required to open it. Commonly, the main induction was also painted red. Pressure in the boat: The main induction is normally the last hull opening sealed. Once this has been done, the hull opening indicator board (nicknamed the “Christmas Tree” in fleet boats) will show all green lights, and the confirmation “Green board” is given. To confirm this, air pressure is released into the hull. If all the opening are sealed, the pressure will hold. In modern submarines, the indicator lights are arranged in a straight line pattern, with open and closed indicated both by the traditional red and green colors, and by positioning the respective indicator lights above or below the midline. When all openings are closed, the green lights form a straight line, and “straight board” is announced. Air pressure is no longer bled into the boat as confirmation, but a careful eye is still kept on the barometer, as rising air pressure would indicate a leak somewhere. Open main vents: Ballast tank vents are opened, allowing the tanks to fill with water. The negative tank is flooded, to increase diving speed. Rig out bow planes: The bow planes, which are kept folded up against the superstructure to prevent damage while surfaced, are rigged out and set on full dive. The stern planes, which are permanently extended, are used to control the boats angle. Close vents: All vents are closed when the boat reaches 45 feet. Speed is reduced to two thirds. Blow Negative: When the depth is 15 feet short of the desired depth, the flooded negative tank is blown to restore neutral buoyancy. This tank is never blown completely dry at sea, in order to avoid releasing air bubbles that might be seen on the surface and reveal the boat’s position to a hunter. Once the flood valve is closed, the excess pressure is vented into the hull. Level off: At the desired depth, the boat is leveled off and speed reduced to ahead one third. Vents are cycled (opened and closed, to insure external ballast tanks have filled and no residual air is trapped), and the diving officer makes any needed adjustments to the trim. When everything is correct, the diving officer informs the captain.